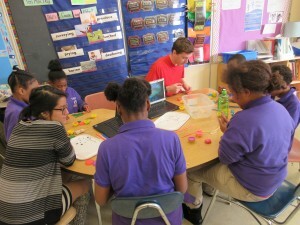 My group decided to focus on the playdoh and its continuing success with the students. Therefore we decided to evolve our activity and lesson around the playdoh. From the previous visits were like how the students fully embraced their creative freedom, rather than restricting them to a constrained material. The lesson plan was about evolution and adaptation of animals through their environments. We started with the group of students sitting around the table and asked them to name a type of bird. After everyone had responded we asked what the differences were between the birds and how it was possible for two birds to be so different and still considered birds. We explained the concepts of evolution and adaptation and announced that we would be demonstrating these aspects with aliens. The students were then split into two groups of four.Each group sat with an RPI student, who had a laptop, and were given a kit to share. 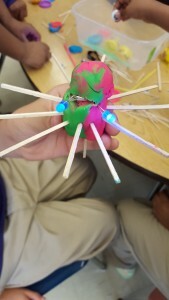 They would create their own individual aliens with playdoh and the additional materials that we brought that would live in the initial environment given. Then they would vote on where their aliens would move to. The RPI student would proceed the Powerpoint to a new slide and the students would change their aliens to be able to survive in the new environment. The RPI students would ask guiding questions to encourage the fifth graders to think about the differences in the environments and how their affected their aliens’ abilities to survive. After repeating this process multiple times, the RPI student would wrap up the lesson and ask the students what had changed in their aliens and if they didn’t change would they have survived in the new environments? The first group of students started with six students, however, more students trickled in as the activity went on. Unlike the first two visits, the groups were not split up by the teacher. The RPI students gave directions that six students should go with one activity and six with another. It took some strong encouragement to make some of the students move. It started the first group with some disorganization. However, once the students were sitting, Zeke and Daisy began the lesson and the general explanation of evolution. Initially the students did not want to focus, they began to crack jokes and talk over Daisy and Zeke. But once that the playdoh kits came out, they sat still in their seats and all their attention went straight to the kits. I was sitting aside to Zeke’s group watching and taking observations. Therefore, I was not able to pay close attention to Daisy’s group. But Zeke’s group started in the forest. 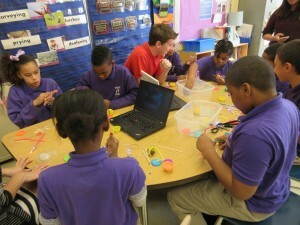 At first, the students were having difficulty opening the playdoh and would ask Zeke and me to open it for them. Then I noticed that they started to use the sticks to pry the playdoh out of the containers rather than using their fingers. Initially, some of the students seemed a little lost with the idea at hand. However, Zeke and I realized the reason when Zeke asked, “Have any of you been to a forest before? Like the one in the picture?” and all the students shook their heads or didn’t answer. Zeke quickly realized and began to list off things that the aliens would need in order to survive. The two boys finished first and they wanted to move along to the next environment before the girl had finished. They showed eagerness and excitement at choosing the environments by leaning forward in their seats and pointing at the screen repeatedly. Zeke used more of a voting process with his group to choose where to go next for the environments and he did the activity alongside them. One of the boys started to make a scenario for this alien. He said that his alien would catch food by drinking it through a straw. 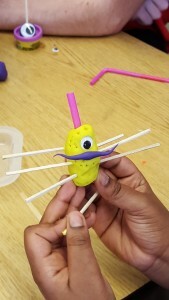 He had attached a straw from his alien to the playdoh container as though it was drinking from it. The boys wanted to go to the poison forest, when the girl wanted to go to the candy cane forest. One of the boys immediately recognized the photo from the Wreck It Ralph movie. It was at this moment that more students entered the classroom. Some of them wandered over to the table and one boy took all of the sticks from the table and refused to share them. A conflict was about to break out when Zeke held out his hand and said firmly, “May I have them please”. The boy immediately became serious-faced and handed them quickly back to Zeke, who dispersed them among the table. The girl made a jet pack and grenades for the dangerous and dark poison forest. When it was time to switch activities all the students insisted that their aliens would not be destroyed. The second group of students listed more birds than the first group. It was quickly apparent that this group was louder and harder to control. They were constantly interrupting each other’s answers by answering themselves or cracking jokes. However, when Zeke raised his voice and said, “Quiet down please”, they listened. When the kits came out, it was a different reaction than the first group. The students quickly grabbed for playdoh and fought over the materials. Another thing that began to happen was that students would grab materials from the other group’s kit. Therefore, Daisy and Zeke had to be stricter than with the first group. But once Zeke showed them the different environments, they began to focus on the activity. There were two students from Daisy’s group that kept trying to be included in Zeke’s group. They included themselves in the environments and the conversation in Zeke’s group rather than in Daisy’s. The boy sitting next to Zeke made one alien then quickly gave up. He put his playdoh back into the container and refused to participate for most of the activity. One boy started to panic when Zeke tried to move on with a new environment when he had not finished his alien. The girl in the group would ask me to help her cut a straw and would specifically point to where she wanted it to be cut. A couple of the students started to use and incorporate the playdoh containers in their aliens. For the winter forest, a couple of students used it as a shell to hide in to stay warm. When the LEDs were brought to the table, Zeke was given them to distribute out to the students. Despite this effort to avoid conflict, the students got into a disagreement because they all wanted a blue one. When they received their playdoh they immediately started to stick it into the playdoh. The boy next to Zeke finally gave in to Zeke when he repeatedly asked if he wanted to join in. However, after only a couple of minutes, he ended up squishing his alien and handed his LED to a fellow student. The playdoh once again captured the attention of almost all of the students. 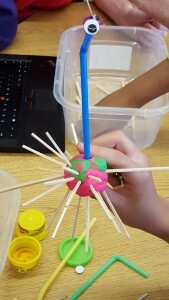 Despite the constraint of making an alien, they enjoyed the freedom to individualize their creations and to be able to do what they wanted with their own ideas. It also became apparent that a large group of the students understood the purpose of the lesson and were able to answer comprehensive questions about adaptation. When asked, the students were able to answer why their alien was able to survive in the new environment compared to the last one. In addition, having organized and portioned kits reduced the number of conflicts between the students. We realized during the activity that as middle class people, we had forgotten that it could be possible that none of the students had ever personally gone to a forest or the beach, and therefore, it was possible that they would not know how their alien should adapt to this environment. Therefore, for future activities, it was important for us to keep this in mind when changing our activity. Also, every time that the students would have to switch groups, many would ask if they could keep their aliens. It was this that started us on the topic of finding something that the students could keep after our activity to remind them of their work and what they had learned.